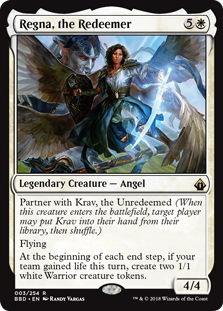 Like all of Battlebond‘s partner creatures, Krav plays best with his designated partner Regna (and vice versa). That’s not to say he is entirely helpless on his own; black does get some ability to generate tokens, especially if you move into tribes like zombies. Abhorrent Overlord and Call the Bloodline also seem like good interactions, as there’s a lot of upside apart from Krav’s own ability. He’s rather on the fragile side, especially compared to other demons, although you could always sacrifice him if things get too hot. Any of the partner creatures from this set will inevitably have their ally brought up, as the two are meant to be played together, by and large. 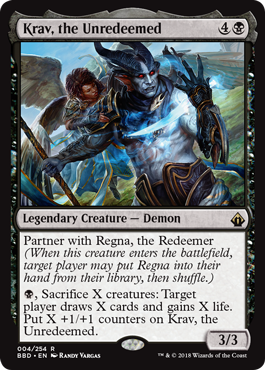 And Krav pairs well with Regna; Regna makes Warrior tokens if your team gained life, while Krav lets you sacrifice creatures to draw cards, make him bigger…and gain life. You see where this is going: as long as you have black mana up, Krav can fuel a cycle of generating a ton of card advantage and power. As a 5-mana 3/3, he needs to really have the ability to pop his ability before he comes into play, but it’s a potent effect he can make use of.